Comparative thinking is one of our first and most natural forms of thought. When we are babies, one of the first differences we must identify is that between our mother and everyone else. Without the ability to make comparisons—to set one object or idea against another and take note of similarities and differences—much of what we call learning would quite literally be impossible. Comparing is an important part of learning and comprehension as we continue to grow. It plays a big part in how we figure out and make sense of the world. Compare and contrast work sheets and essays are a fundamental part of our education from grade school all the way through college. 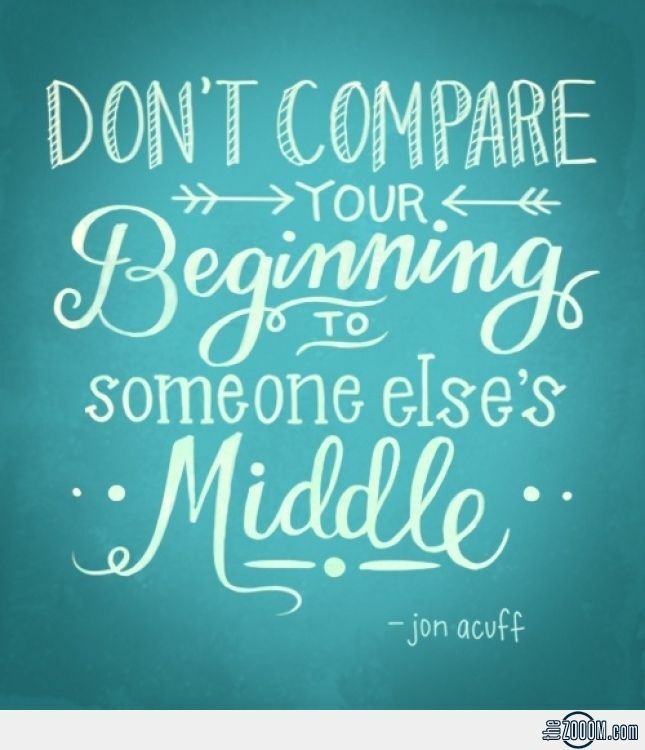 Comparing isn't inherently bad. Until we make it as such. As grown ups we often use those innocent skills to feel inadequate. Incomplete. Or equally as bad- better than someone else. Comparison no longer only helps as it was intended to. It becomes a gateway to other negative feelings like entitlement, inadequacy, anger, judgement, and jealousy. Social Media really gets me comparing. That's one reason I can't be on it too much- I compare without even realizing it. I just don't feel good about my life or myself while I'm comparing. I'll judge the mom in the inappropriate bikini. Or the over-poster. The desperate for attention'er. The "I just made this amazing meal" mom. The "I just ran 40 miles and did yoga" girl. I get sad about the, "My kid just said the funniest thing" posts. And the vacationers. And the people who are doing everything better and funnier and faster and slower and smarter than me. Sometimes I wonder what the whole of life is about. I can say pretty confidently it's not about judgement, anger or comparison. It's about focusing on the unique one of a kind gifts we have been blessed with. It's impossible to discover what those are while you are focusing on someone else's gifts. We can't be amazing at everything. We also can't be awful at everything either. The older I get the more I can truly accept that no one has an even close to perfect life. And the people who are desperate to make others think their life is perfect is usually hiding their actual truth the most. Our biggest struggles are also our greatest teachers. They are also a bridge that directly connects us to other people. We isolate ourselves because we are certain that no one else can understand our struggles or our heart. We don't have to compare the situation. Feeling the same feelings are enough. Fear, inadequacy, pain, loss those are as universal as a smile or tears. I thought long and hard about why I compare. What am I getting out of it? Clearly it's something or I wouldn't do it at all. I think it's an important yet hard question to ask yourself. I got near the heart of it. Because I want to be the... Best? I answered. To make other people feel bad? I asked myself. NO! Of course not. Because I want to feel... worthy. Because I want to feel worthy. Enough. Loved. Accepted. And that very truth made me instantly understand myself just a little better. I'm always going to find someone who does more. Who has more. "Oh precious girl", I answered, realizing how hungry I am to be kind to myself. "You are already worthy. Not because you do anything the best. But because you do YOUR best. Because you love like there's no tomorrow. Because you notice things like golden sunlight and God in the grapes that grew in your yard." Comparison is only human, but when it causes nothing but pain it's important to relearn how to think. Comparison puts the focus on the wrong person- someone else. We have to bring a kind and non-judgemental focus back to ourselves. Whether you are a writer, teacher, doctor, landscaper, or mother, you have a important perspective built on your unique experiences and unique gifts. You have the capacity to love your people better than anyone else. Chances are you have everything you need to accomplish happiness in your little section of the world. All you need to do is realize it. You are SO right. All of it. Realize it and practice. Vulnerable, honest, brave, wise, words. Keep running your race, lovely lady. You do YOU...beautifully. Wise words. So easy to agree with yet hard to take action on. On things like my son not reaching milestones at the same time as his peers, I've gotten much better, but I do still find myself doing the comparing game in so many other aspects of life. Thank you for sharing this. It is a learned behavior for me, from my mother. "Oh, I bet you were the prettiest girl there, weren't you?" "I'm sure you got the highest score on the test, right?" "You have to be the funniest girl of all of your friends, don't you think?" So, I thought I had to be ALL those things ALL of the time. I thought I had to be the -est to have an identity. If I wasn't the -est, who was I? It has been a struggle in adulthood to stop comparing myself, to not be jealous if I come up lacking, to celebrate other's success. I'm trying to remember when someone achieves more - that does not mean there is less for me. I try not to set my son up as the -est, because I know you teach what you have learned. And, of course to me he is the -est of all <3 but I know first hand that will not serve him well. Wonderful: I have the capacity to love my people better than anyone else! I needed that reminder. Praying for you always!